The year started off with two challenges; a run every day of the month for Janathon, and hence 342 miles covered and three runs in the 20 mile range. And the viewtube Jantastic team came 10th out of over 1,000 teams in the 3 month challenge. February was a quieter month of only 188 miles and four runs in the 20 mile range, and pacing duties on a runner’s first Half Marathon [my only one of the year]. March remained a fairly quiet month of 233 miles and three runs in the 20 mile range but with also my first marathon of two in the year on an upppy downy 2km loop course in 3 hr 43 minus. The end of the month also saw me take part in the SportRelief 6 mile run in the Olympic Park on the day I started my Thousand Day Challenge to run 10,000 miles. April saw an increase in mileage to 275 miles but only two 20 mile range runs due to increased stair climbing training in preparation for May. I took a team down to the London Marathon to volunteer on the baggage area before the race start. A pretty ‘timid’ month but I did get back to almost daily running. May was a bigger month, although the mileage stayed constant at a similar level of 278 miles, and there was only one run of 20 miles, but there were three races; a chased by a car hilly 18 miler Wings for Life and my second marathon of the year in what was at first 3.20 pace but ended up rather slow at 3.55, and my first ever one mile race [6.25]. The month also included a stair climbing challenge to conquer Everest which ended prematurely after only 8 hours. And a British Heart Foundation jog. And the Wanstead Flats parkrun 3rd anniversary. June saw mileage stay at the same level of 265 miles, and although there was only one run in the 20 mile range I did also cover 40 miles twice; the first time was the inaugural Run2work day [which I also did several more times in the year at shorter distances] and the second was the parkathon 5km x7 where I also ran between the events for 42 miles total as the year’s first ultra. I also [just about] ran daily for the Junathon challenge. July saw the start of a miserable three months were I struggled to run due to reasons beyond the actual running. Only 164, 123, 170 miles were covered and only two runs in the 20 mile range. The quarter did include a 5 mile race in the Olympic Park and the turn around mentally at the inaugural Spitfire Scramble 24 hour relay race in late August, where a team of viewtube runners came 9th out of 20 teams. September saw a gradual return to consistent daily running. October marked a return to a decent 256 miles for the month but with only one 20 mile range run. A fun 10 week challenge to run 12 hours in the Olympic Park was started [and finished in 2 weeks]. Nothing remarkable but the month did set the foundation for a good Autumn. November was the third Movember Milo Miles challenge to ‘run the dates’ during the month, essentially a multi-day Ultra event, which was again completed successfully with 565 miles. A new PB. December saw a steady recovery 271 miles which included a 50 mile Ultra in under 8 hours, a 10K race and a 1 mile Hill Climb event. 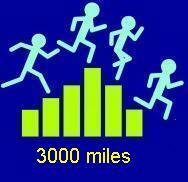 Miles total 3122 miles, average approx. 60 miles a week. 320/365 days run. A TDC deficit of 386 miles.